Whether you want to make wine, dry raisins, eat fresh grapes or drink grape juice, you’ll begin by growing grapes. Sure, you can buy table grapes at the market, but if you have enough room, why wouldn’t you simply have plants that can provide sweet fruit for decades? Many grape varieties will produce vines with an average lifespan of 50-100 years. With that in mind, let’s go over the right way to start out with planting these long-lived fruit providers. We’ll talk about some specific varieties, and discuss the optimal growing conditions. You too can start your own grapevines for future winemaking efforts or just for delicious fruit to snack on. Let’s get started now! Common Name Grapes. Also hundreds of individual cultivar names such as Thompson’s Seedless, Flame, Concord, or Merlot. Soil Well-draining, accepts wide variety of soils. Many wine grapes grow well in poor soil quality. Rich soil preferred for table grapes/raisins. pH is variable by type. Fertilizer Top-dress with compost or aged manure early in spring. Alternately, use 10-10-10 fertilizer once or twice during growing season. There are hundreds of varieties of edible grapes in the world. 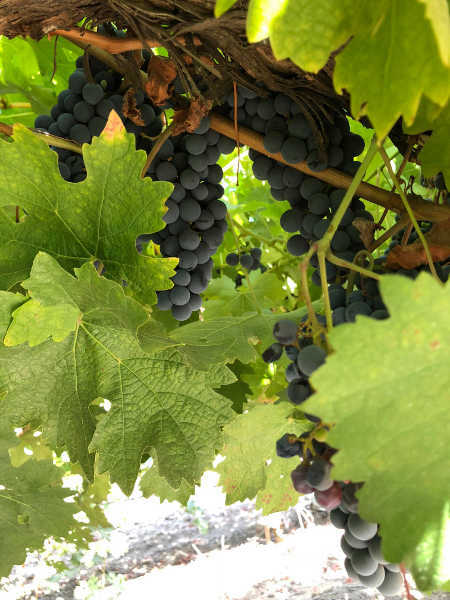 In fact, there’s a fantastic list of grapes from UC Davis which currently has 594 varieties with 2345 different individual cultivars — and that’s just the more popularly cultivated edible kinds! Overall, there are 79 species of grape in the Vitis family, and not all of them provide fruit that’s edible to humans. But there’s no way to cover every variety in one article, so let’s explain a few different categories which the grapes fall into. There are three basic types of grapes: American, European, and hybrids. American grapes originate in the United States. There are a number of different species of American grapes which vary in terms of their preferred environment, some being much more cold-hardy than others. One of the best known American grapes is the Concord, which is a cultivar of Vitis labrusca (fox grape). 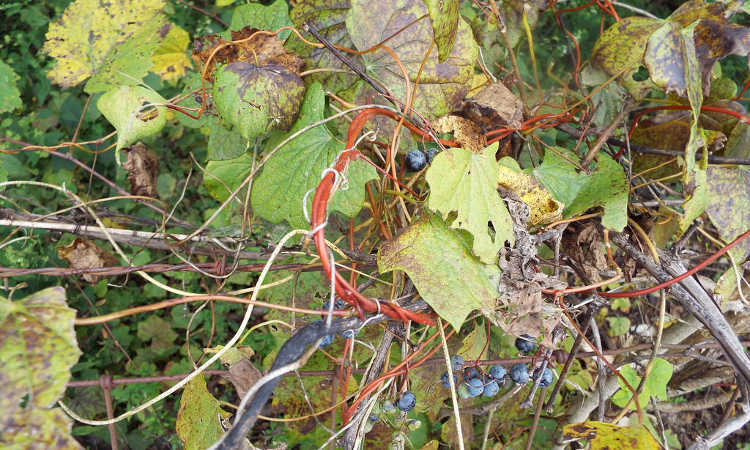 There are many other cultivars or hybrids of Vitis labrusca available as well. 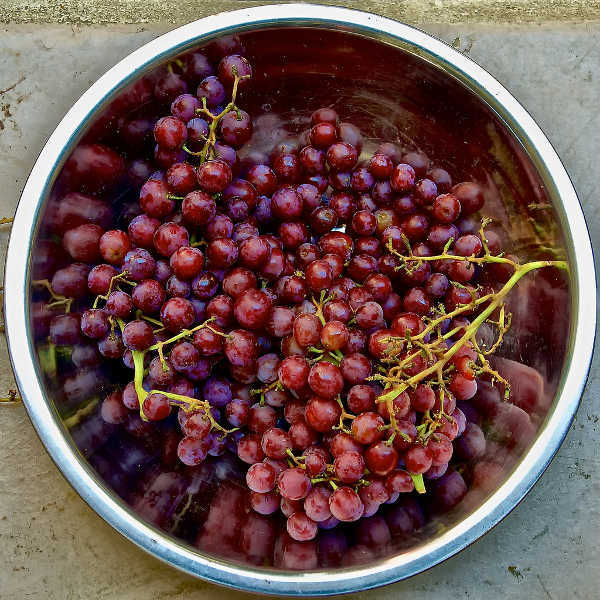 Other species of American grape include Vitis riparia (riverbank grape or frost grape), Vitis aestivalis (summer grape or pigeon grape), Vitis californica (California wild grape), and Vitis rotundifolia (muscadine grape). European grapes have their origins in the Mediterranean, Europe, and Asia. Of these, Vitis vinifera (European grape) is the most widely cultivated. Most of the wine grapes of the world are this species or are hybrids that use Vitis vinifera as a base. 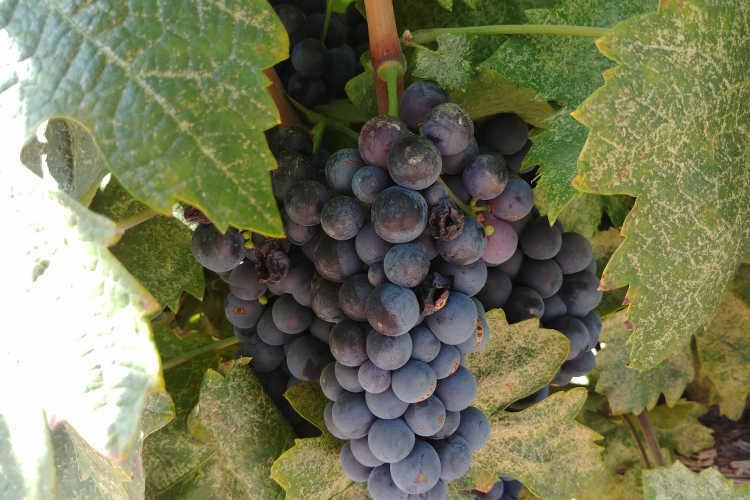 Hybrid grapes typically blend together European and American grapes to produce cultivars with particular qualities, such as a European wine grape that can tolerate warmer climates or is drought-tolerant. These are also developed with resistance to certain diseases or pests. In addition to hybrids, it has become quite common practice to use a rootstock of one variety with grafted vines of another variety on it. This is especially useful if the roots of a species are subject to damage from specific pests. A different rootstock will be selected to protect the vines. 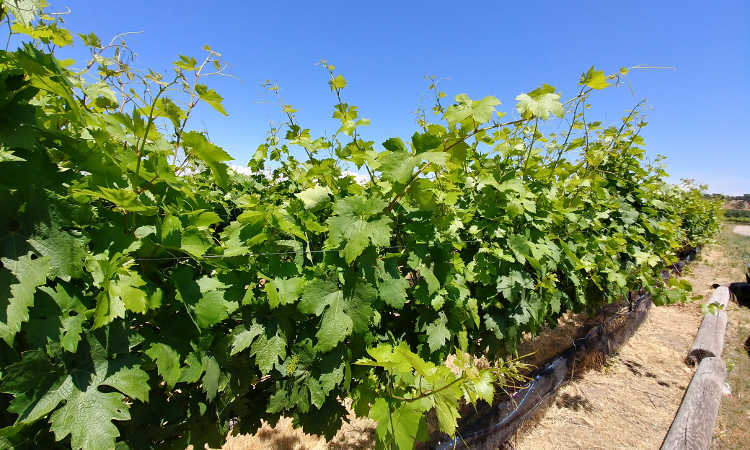 While using different rootstock from the fruiting grape does not make it a hybrid, it does require specialized skills which are often found among the hybrid grape producers or in the nursery industry. These can even be customized to the specific combination of root and vine preferred. While all of the grapes may be broken down into points of origin, they are often separated not by location, but by use. When growing grapes, it’s a good idea to select your variety based on what you plan to use the fruit for. Different varieties have different uses, and while some may be good crossover candidates, not all of them are! There’s hundreds of variations on wine grapes that are suited to all parts of the world. In fact, the most common names for wine grapes coincide with the wines that use them. Cabernet sauvignon, merlot, petite syrah, muscat… these are all types of wine grapes with distinctive flavors. There are hundreds more, but the ones I’ve listed make up a number of the most popular wine varieties. Keep in mind that this is by no means a complete list! 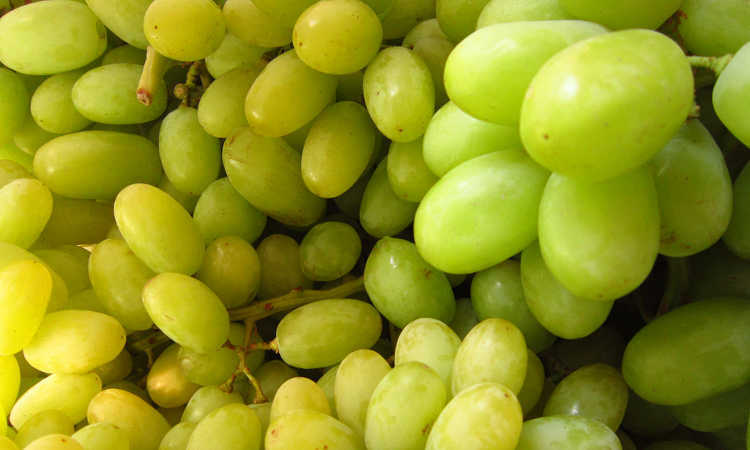 These are sweet and juicy grapes that we all love to eat! Table grapes are ready to consume straight off the vine. Sweeter than many varieties of wine grape, these are snack food or salad toppers, providing a sizeable potassium boost that many other fruits can’t offer. Many table grapes have been cultivated to become seedless over time, as they’re easier to eat when lacking the woody and hard seeds. What of the storage grapes? Well, dried grapes become raisins, and this popular culinary ingredient is used in everything from meals to desserts, or eaten on their own. A number of varieties are especially good for this purpose as they dry extremely well on the vine. Selecting a raisin grape requires choosing a variety which has a very high concentration of fruit sugars, as this will help preserve the future grape for months to a year after drying. If you’re looking for something that can be stored as a juice or a preserve, there’s cultivars for that as well. While there’s many varieties that lend themselves to these purposes (even the wine grapes can make delicious jellies with a hint of winelike flavor), these are notable choices. 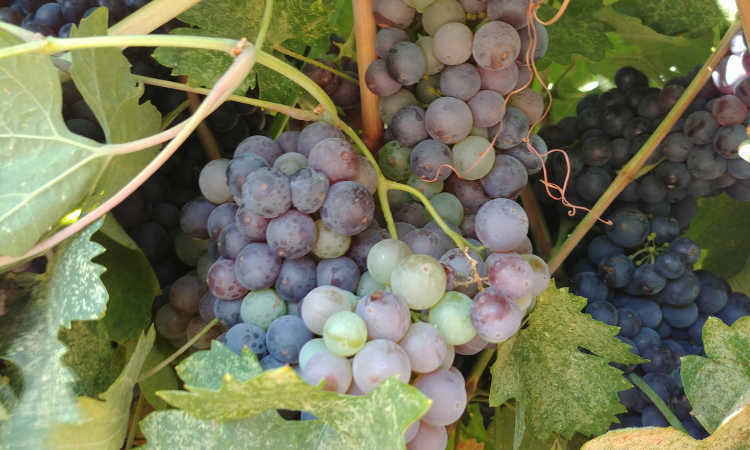 There are some grapes, such as Thompson’s Seedless, which are used for making concentrated juice, fresh juice, raisins, table grapes, and even wine. There’s about nine different cultivars of Thompson’s now! It’s extremely popular, especially for retail sales. Concords are used for juice, but also for jams, jellies, wine, and in canned grapes such as those in fruit salad. Black Spanish can be made into wines, juices, or eaten fresh. And there’s many more crossover grapes as well, including a number of popular wine grapes such as Tempranillo. If you’re an amateur to grape growing, it’s likely you’ll want to opt for a grape that has a wide variety of uses like Thompson’s seedless or Concords. Flame seedless is another popular grape and raisin choice for novices. Let’s go over some of the early stages of grape growing. This process takes a lot of preparation in advance, so you may want to start planning and preparing in the fall months for spring planting! Planning for grapes is a long-term process, but the actual time to plant existing bare-root or potted grapes would be in the early spring months. You will want to pick a day as early as possible after the risk of frost has ended. Ideally, your site will already be prepared in advance so that you can simply get the grapes in the ground and get them going. If you wish to start from seed, this process begins much earlier. You need to stratify your seeds to get them to germinate. To do this, place the seeds to be planted into a bed of damp peat moss, damp paper towels, or moistened sand and place them in the refrigerator for 3 months. After they have gone through 3 months of 35-40 degree temperatures, you can plant your seeds into small pots. Maintain a soil temperature of 70 degrees to induce germination, and keep the soil lightly moistened. Germination can take between 2-8 weeks, and once your plants reach 3 inches in height, transplant them to at least a 4″ pot. Keep them in greenhouse conditions until they are a foot tall, then harden them off for outdoor transplant. All in all, you will need to start your grape seed stratifying in the fall months, plant them in winter, and have them hardened off as early in the spring as possible. So prepare well in advance for your future vines! As your grapevines can live for fifty to a hundred years, you will need to pick a location where these can remain indefinitely. These are full sun plants, so selecting the right location is imperative. Northern hemisphere-dwellers like myself should aim for a south-facing location where they will get consistent sun year-round. For southern hemisphere-dwellers, opt to go for north-facing locations. Your location needs to be prepared with a support well in advance. You can use a trellis, an arbor, or any number of other types of support structure, but it needs to be there when you plant your vine. Depending on the variety, you’ll need a minimum of 6 feet of space between plants. Some varieties require even more. This allows for plenty of room for the deep roots to spread. 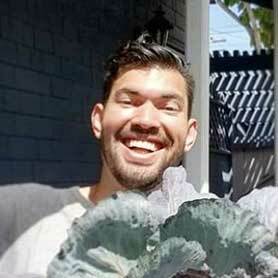 Opting for container growing? If so, your container must be at least a 15-gallon sized container. Avoid dark-colored containers that will heat up in direct sunlight, or if you must use those, ensure the container itself remains shaded. These will still require a support structure. Dwarf types are best for container growing, but even they require some form of trellis to climb, so plan in advance and be sure that your supports are extremely sturdy. The vines will literally be growing around them, which makes the support hard to replace. I personally recommend opting for metal posts with heavy metal wires to form your trellis, but there are many other methods out there. Just remember that it needs to last as long as your vines do! Bare root grapes should be soaked in water for at least 2 hours prior to planting. Potted grapes should be watered well the day before to reduce transplant shock. Begin by digging a hole that is a minimum of a foot wide and deep. Add four inches of good topsoil to the bottom of the hole, then examine your plant’s roots. Trim off any which are broken or damaged. Set your vine into the soil slightly deeper than it was in the nursery, then backfill 6 inches worth of soil into the hole. Tamp that down firmly, then add the remaining soil to fill the hole without tamping it down. Once your vine is in the ground, prune back the top to a few buds (2-3 optimal, but more if it is older) and water it in thoroughly. There is a very distinct growth cycle which grapes go through each year. 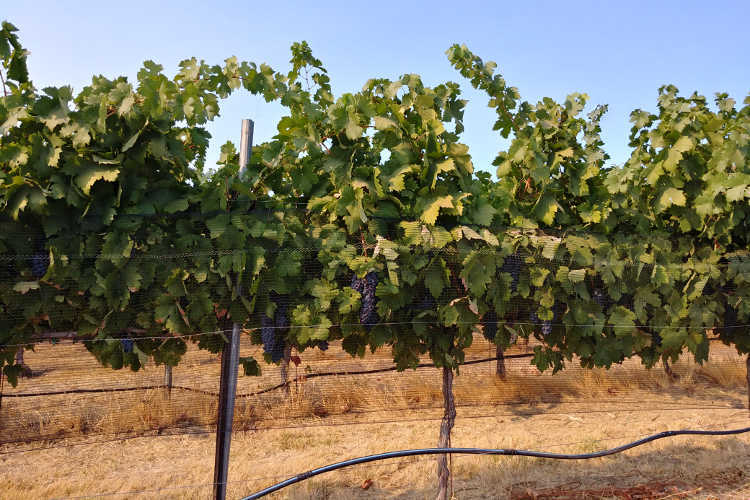 Let’s go over the various stages of growth in limited form to give you an indication of what to expect from your vines annually. In the early spring as the vine comes out of dormancy, it begins with “bleeding” of vines which were pruned during the winter months. As the soil warms, water will ooze out of places where the cane was cut. 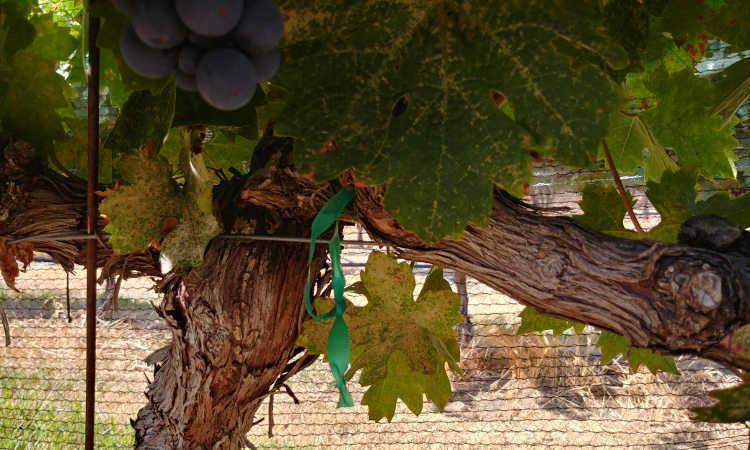 One vine can “bleed” up to almost a gallon and a half of water. Once the “bleeding” ceases, the plant will focus on new buds. Tiny bud locations that developed prior to dormancy will begin to swell and slowly form new shoots. It can take up to a month for these new shoots to form leaves and begin serious growth. When the shoots do begin to grow rapidly, they can grow up to an inch in length per day, and the plant will rapidly begin to form new leaves along its vine. If there is still frost danger during bud break, these young buds and shoots are at risk and should be protected from the cold. Once the temperature is between 59-68 degrees consistently (usually 40-80 days after bud break), flowering will occur. Initially, this will appear as a button-like growth on the tips of new shoots. 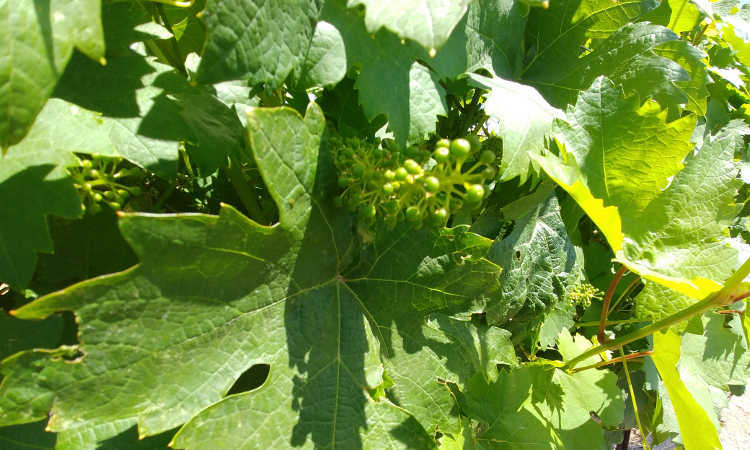 Within a few weeks time, these early clusters will develop into larger flower clusters. During the flowering stage is when pollination occurs. While most commercially-grown grapevines are self-pollinating, wild ones are not and require insects to pollinate the flowers. In addition, this stage is when fertilization and seed-set occurs, forming tiny dots that will become seed. Heavy rains or wind during this period can become a problem, as the fertilization is what causes fruit to form in the future and the rain or wind can prevent fertilization. In addition, low humidity, high temperatures, or drought conditions can cause a reduction in fertilization. 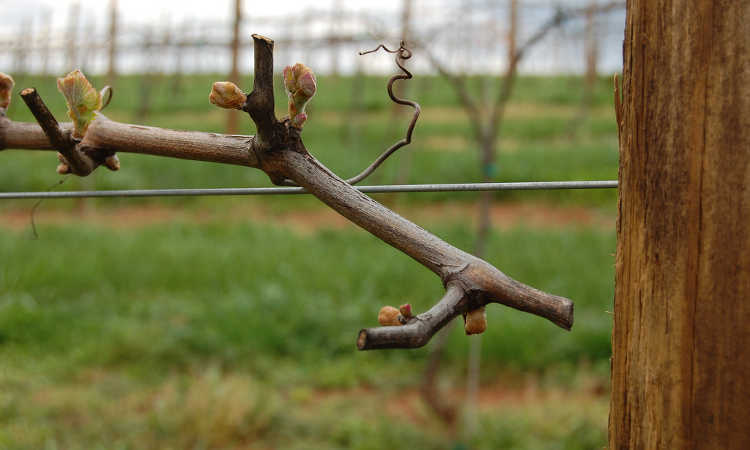 Also during this stage is when young buds that will become the next year’s new growth begin to form. They will be subtle and small at first, little more than a bump at the joint of prior shoots. As flowering subsides, fruit set begins almost immediately. Fertilized flowers will begin to form tiny green berries in which the seeds will eventually fully develop. It is during this stage when the future yield of the crop can be estimated. Different species of vines will have different average fertilization, but typically between 30-60% of flowers will be fertilized. The higher the number of flowers that were fertilized during the flowering stage, the more fruit your vines will eventually provide. Flowers which did not become pollinated and fertilized during the flowering stage will dry up and fall off during fruit set. As fruit set concludes, the eventual fruit will be green and hard to the touch. It’s inedible at this point as it’s unripe. Veraizon is the stage wherein the young grape berries begin to ripen. Initially, the grapes will swell to about half of their future size. 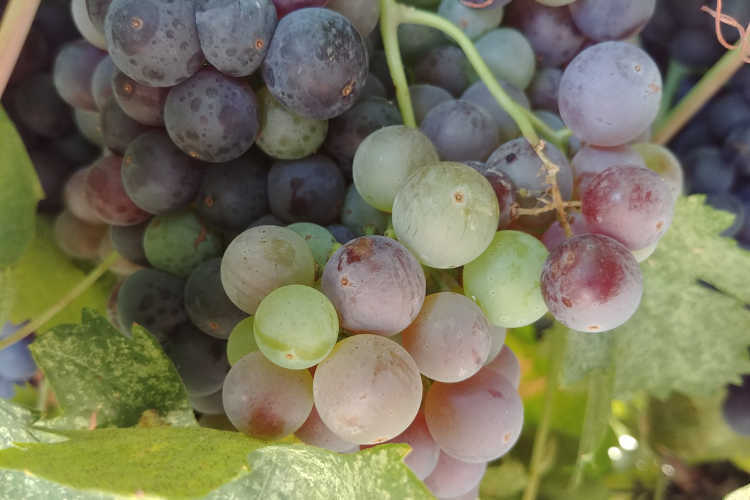 The colors of the grapes will begin to change depending on the variety, taking on the red, black, or yellow-green hues that we associate with ripe fruit. 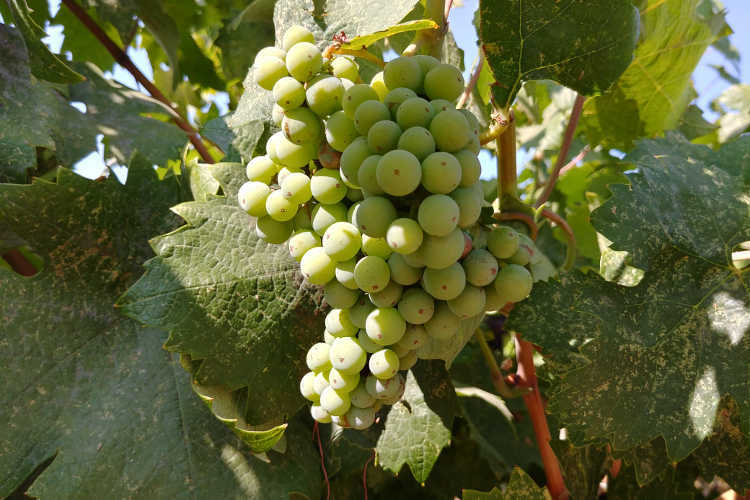 These young fruits will continue to swell after the color changes, and within 6-8 days of the start of veraizon on a particular grape cluster it will begin to grow dramatically. The fruit begins to soften, and the vines begin to lose their green color and start to turn brown and woody. Not all of the fruit will enter veraizon at the same time. In fact, fruit which is more exposed to direct sunlight usually enters veraizon first. Fruits which have been shaded are prone to a later veraizon period. This may extend the harvest. Gauging ripeness really depends on the variety and outside factors such as disease, but harvest generally happens at the end of veraizon when the grapes are at their optimal size and when the sugars inside the fruit have become concentrated. Ripeness is highly subjective depending on the intended purpose of the fruit. For winemakers, it may be a certain level of tannins that they desire for future wines. For table fruit or raisins, it is when the flavor is at its peak, making the fruit sweet and delicious. After harvesting, the uncut vines will continue to turn harder and woodier. The leaves continue their photosynthesis process, but the plant is now storing carbohydrates in the roots of the plant to sustain it through winter dormancy. Over time, the leaves will begin to yellow and brown, and they will eventually drop off entirely, leaving bare canes exposed over the winter months. This also leaves the buds which formed exposed to the elements, but they should have browned and turned solid for dormancy. As the last few leaves fall, the plant enters its dormant phase for the coldest months of the year. It will remain inert and without outward signs of life until the spring when bud break begins anew. While a little finesse is called for when growing grapes, there are some simple basics which will net you quality fruit for your table. From here, we’ll explore the rudimentary basics, along with a few tips to take your fruit to the next level. At a bare minimum, you’ll need to be sure your grapes get six to eight hours of full sun per day. Too little light will lead to a host of problems, including powdery mildew, lower fruit production, and lower fruit quality. It may be impossible for us to control the weather, but once bud break starts, it’s important that we ensure the plants have the best conditions we can provide for them. Positioning them in a location where they will have continual sun is the best bet. Grapes can grow anywhere where there are cool winters and warm summers. 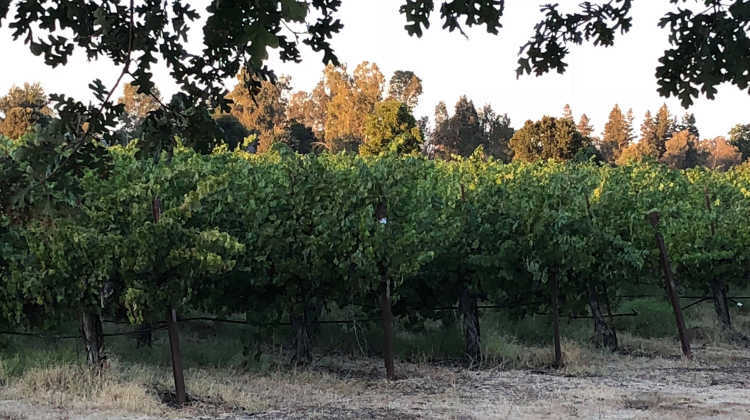 However, they seem to do best in areas where it’s cool but not extremely cold, which is one of the reasons why the Napa Valley in California is known for its wine harvests. Overall, the best growth conditions seem to be between zones 6-8 in the United States, or comparable climates elsewhere. They will require temperatures above 50 degrees for about 150-170 days per year to form new growth and to develop fruit. In addition, at anything less than 50 degrees, the vine’s metabolic systems will begin to shut down to prepare for dormancy. To the plant, it appears that winter is approaching and it begins to prepare for its dormant stage. Winter temperatures are important as well. Cooler temperatures at or below 50 degrees for 2-3 months of the year is important. 40 degrees is the optimal range. Some varieties of grapes are more cold hardy than others. There are many varieties that are accustomed to snowy winters, in fact. Some species of American grapes are cold-hardy to -20, and a number of hybrids are good to -15. European grapes are often fine to 5 degree temperatures. Determining the right amount of water for growing grapes can be tricky. Your soil should be damp, but not soggy, as grapes can rapidly develop diseases if it’s too wet. While grapes are somewhat drought-tolerant, they typically produce less fruit when they’re under water stress conditions. Ensuring they have the right amount of water is important if you want good fruit production. Most commercial growers opt for drip irrigation systems to water directly into the root mass at the base of the plant. Mulching around the plants to maintain moisture can also help, especially during the heat of the summer months. Mulch also reduces weed development. In the first year, a good rule of thumb is to water at least once per week until the soil is damp 6″-10″ deep around the plant’s roots. 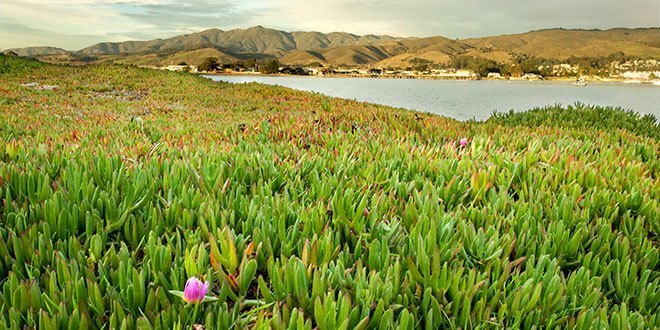 In subsequent years, water once per week until damp 12″ beneath the soil’s surface. Provide additional water if the weather is particularly hot. Drip irrigation is also recommended to keep water off the leaves, as excess moisture on the leaves promotes fungal diseases. If you must hand-water, try to avoid spraying the leaves, and water early in the morning to allow any excess moisture to evaporate in the sun. Testing the soil with a probe to check the moisture can be useful. However, you can also check it literally by hand. Use a trowel and pull back the soil until you can get a couple inches beneath the soil’s surface. Scoop out a handful of soil and squeeze it into a ball. If the soil sticks together and your hand feels cool to the touch, your vines are getting enough water. 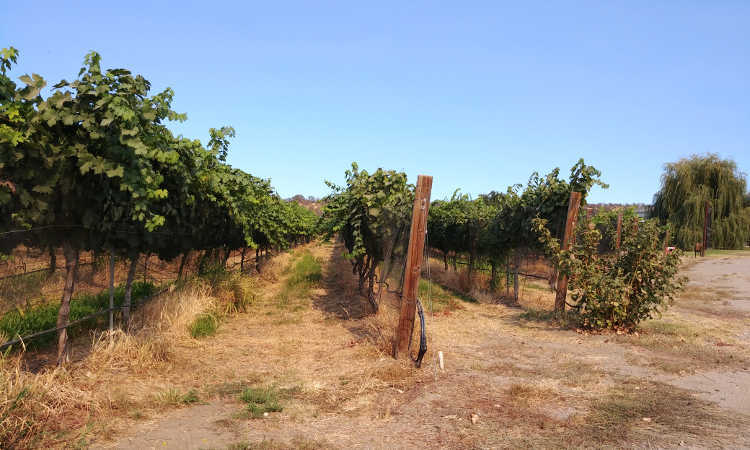 If the soil does not stick together and crumbles apart, and you aren’t experiencing the effect of evaporative moisture cooling on your skin, water your vines. Grapes require well-drained soil. The soil needs to hold enough moisture (see the “watering” section above) to keep the vines happy, but too much water and you’ll experience issues. However, grapevines are tolerant of a great number of soil types. Limestone-rich or clay-rich soils, sandy soils or silty ones can change the flavor of your eventual fruit. This is actually desirable amongst many winemakers, as they can achieve certain flavors only with their soil. The same holds true of home-growers, however. Your soil will make grapes that taste different than ones grown in other soil conditions, and your eventual fruit may not be identical to grapes from anywhere else! Poorer soils will produce smaller grapes. For winemakers, this is actually preferred as the smaller grapes have a larger skin to juice ratio, and the skin provides flavor. For table grapes, you will want richer soil to provide plenty of nutrition to the vines. I highly recommend that if you have clay-like soils, you work lots of compost into your soil before planting. Use at least 2″ of compost over up to 10 feet where the plant will be growing, and work it in to at least a foot down. This helps the soil drain plus adds nutrients. pH requirements for grapes vary from variety to variety and can also be affected by your local conditions. A good baseline is to aim at 5.5-6.0 for wild or local native species, 6.0-6.5 for hybrids, and 6.5-7.0 for Vitis vinifera varieties. However, doublecheck your cultivar’s needs. For container growers, you can opt for a light potting mix. If you wish to blend local soil into it, by all means go for it. Just be sure that it drains off the excess moisture easily to prevent soggy roots. Unless you have bad soil, you shouldn’t need to fertilize in the first year at all. Any amendments you have made prior to planting, plus the soil’s natural quality itself, should suffice. In the second and subsequent years, top-dress at the base of your plant with either compost or aged manure. You may also choose to lightly fertilize with a 10-10-10 fertilizer up to twice during the growing season, but grapes typically don’t like to be heavily fertilized. I personally find that top-dressing in the spring with a thick layer of compost or aged manure is the better choice. Many vineyards seem to agree with this, as one of the most popular fertilizers for wine growing is a blend of aged manure and vermicompost. As a general rule, any heavy pruning should be done in the late winter or very early spring while the vine is still dormant to avoid damage. Additional light pruning may be needed, but only in set circumstances. Always use sterilized tools. Most pruning will be done with a good pair of pruning shears, but the heavier wood may require loppers or a bow saw or pruning saw. The first few years of pruning and training are the most complex. Once your vines are five years old or older, maintenance pruning is required, but less training is necessary. Here’s a good overview of a very basic cordon (T-shaped) training and pruning regimen. First Year: The goal in this year is to get the root system to develop and strengthen. Remove all flowers that develop on the trunk to keep the plant focused on that root development. Prune off all vines except for the ones you wish to become future hard growth. 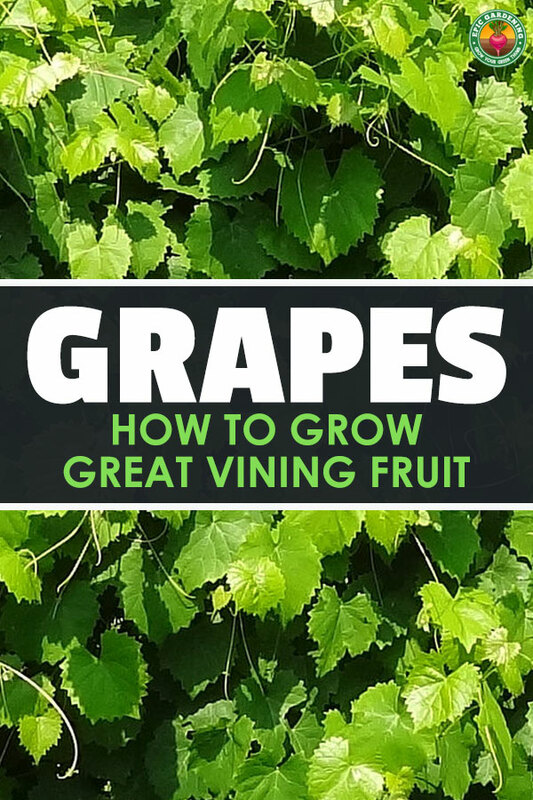 It’s best to select 1-3 of the most vigorous vines to keep. For this first year, the goal is to focus on the trunk and to encourage that deep root development, so while you want to maintain those vigorous vines, don’t worry about training yet. Second Year: In this year, you still want your roots to develop further so that they reach deep under the soil’s surface. Remove the flowers, and prune off any buds or shoots that appear below the vines you kept the prior year. Loosely secure last year’s old vines to your trellis in the configuration that you want as they reach the right height. These now become “cordons”, or a horizontal extension of the trunk, and will become a permanent fixture. Prune off any excess shoots that form off the trunk. While you will want to keep some shoots of fresh growth on the cordons this year to become one-year old fruiting wood for the next year, you also want to be sure there’s plenty of airflow to prevent fungal issues. Prune off excess to allow for good airflow and sunlight penetration. Third Year: Allow some flowers to develop and progress through flowering and into fruit set on the fruiting wood that developed in year 2. Continue pruning off any buds or shoots that grow beneath the cordons or along the trunk. Allow new vines to grow from the cordons. During this year’s winter pruning, remove any second-year fruiting wood from the cordons, keeping only the third-year wood. Leave two nodes with buds on the older wood so it can develop new growth in the future. Fourth Year: This year, you can allow all flowers to develop if you wish. The root system should now be well established and deep. Continue to prune off buds or shoots that form along the trunk or beneath the cordons. From this year forward, you’ll be pruning off the prior year’s canes while the plant is dormant (keeping the renewal nodes) and keeping the younger canes to produce fruit starting in the spring. This annual trade-off (removing the oldest canes and leaving the younger canes behind) ensures you’ll always have one-year-old fruiting wood for the next year’s fruiting, but will maintain plenty of airflow to prevent against diseases. While I briefly went over how to plant grapes from seed in the “growing grapes” section above, there are two basic forms of propagation: from seed or from dormant-wood cuttings. New green shoots do not make for the best cuttings. You want one year old growth for this process, and you want to propagate after the vines have gone dormant, usually in the late fall once the plant has lost its leaves. Select a one year old cane that’s about the diameter of a pencil and about six feet in length. Leaving one node on the plant, cut off the cane with a pair of pruning shears. From that cut point, count four buds up, between 12-18″ in length, and make another cut. Dip the bottom end into rooting hormone (being sure that you have not lost track of which is the bottom! ), and plant in the soil with three of the buds underground. Be sure the fourth on the top end is above the soil’s surface. Over the subsequent winter months, this year-old cane cutting will callus over its exposed cut surface and will develop some small roots. Not all cuttings will survive the winter, so be sure to prepare more than you need. In the spring, those which survived will begin to develop new growth. If you planted them in a deep pot, you can transplant them at this point. Those planted directly in the soil should be treated as new grapevines. Failed vines that do not produce new growth by the end of spring can be disposed of. Transplanting is identical to planting a bare-root grapevine. Remove it from its pot, checking the roots to make sure they’re intact and in good shape. If it’s rootbound, loosen the roots somewhat so that they can spread naturally. Plant in well-draining, pre-prepared soil slightly deeper than it was originally planted (about 1/4″ to 1/2″ deeper). Backfill some of the dirt and pack it down firmly, then fill the rest of the hole with loose soil without heavy packing. Water it in well. 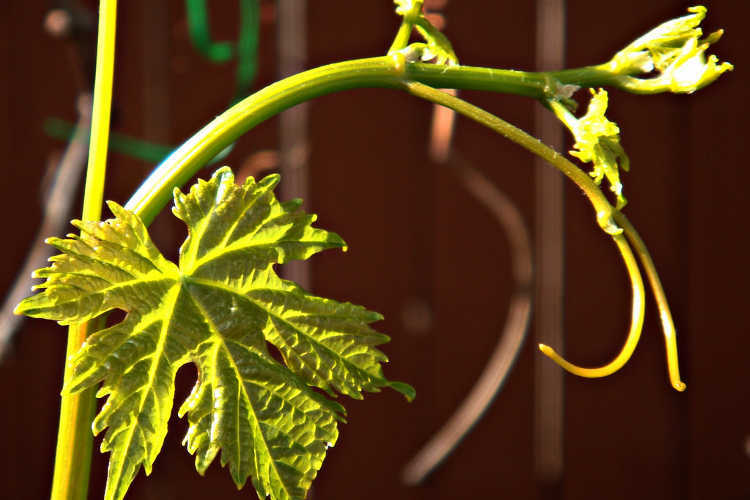 If you’re transplanting an older grape vine that’s attached to a trellis, this can be a very complicated process if not impossible. 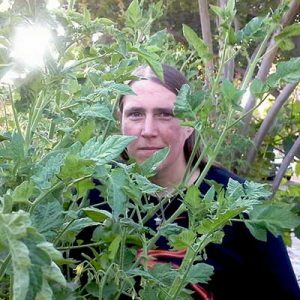 I recommend trying to avoid transplanting older vines whenever possible by starting them in a 15″ or larger pot so you don’t have to transplant them again. The harvest is when the skill of the grower really comes into full play. Determining when your grapes are ready to be harvested is complex, and there are different ways to harvest for different future uses. Let’s go over the basics here so you have an indication of how to begin! If you’re planning on making raisins from your grapes, skip ahead to the “making raisins” segment below. But for all other uses, the harvesting process is similar. As grapes come out of veraizon, their sugars will have developed somewhat. But deciding when the perfect time to harvest will be is highly subjective, and it’s a very short window. You want to harvest when the flavor is best, the grapes are full of juice, and the sugars are high. Picking that time boils down to a few specific attributes, though, and only you can decide which of these is of primary importance to you. Taste: Every variety of grapes has a specific taste. 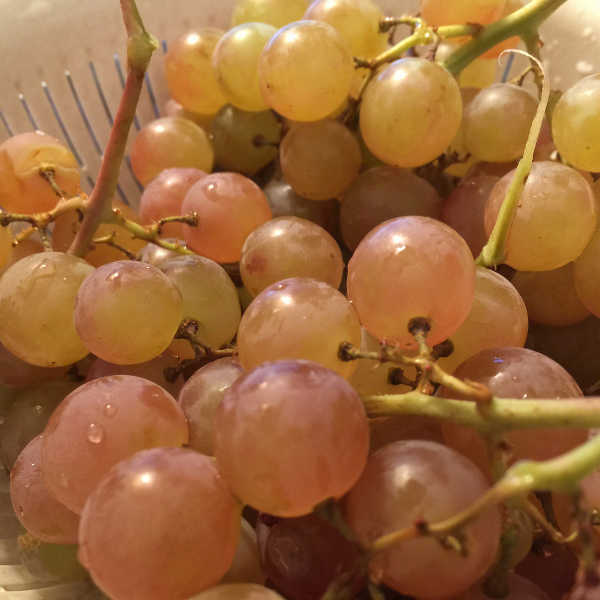 It’s really good if you know what your specific grapes are supposed to taste like, but the goal here is to harvest when they are at their sweetest and before they begin to lose their plump juiciness. Pick from a few clusters and taste them! Plumpness: Take time to feel the grapes with your hands. They should feel as though they’re full of juice, but not hard (which would be before the end of veraizon) or starting to wrinkle (which is after their peak). Visual Test: Your grapes should be uniform in color on each bunch rather than a mixture of colors. If the colors are mixed, that bunch is still undergoing veraizon and should not be harvested yet. However, color isn’t everything. It can take 1-3 weeks for sugars to form post-veraizon! Another visual test is to examine the seeds inside the grape and check their color. The seeds should be uniformly brown, not tan or white. Watch The Wildlife: If the birds are starting to greedily consume your grapes, it’s a sign of two things. One of those things is that you need to put bird netting up before they eat your entire harvest. The other is that your grapes are probably ready to eat, because the birds can tell! The actual harvesting process itself is surprisingly easy. Simply take a cluster of grapes in your hand, find the stem at the top, and snip it cleanly off with sharp pruning shears or scissors. If you’re concerned about spreading disease, sterilize your pruners between cuts. However, as the plant’s going to be going dormant soon and likely will be pruned in the late winter, disease spread during harvesting is fairly uncommon. For raisins, you want to start by being sure that they are ripe as described above. 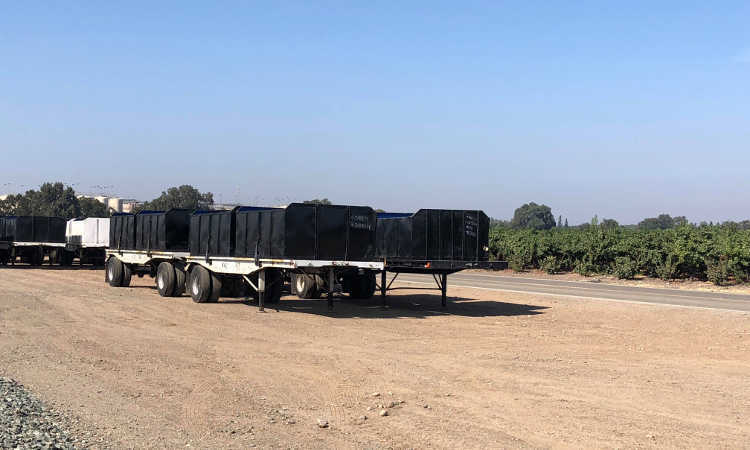 But at that point, you want to prevent the plant from taking back any of the moisture that’s in the grapes, as that can reduce the sugar content of your finished raisins. To prevent this, you will need to cut through the one-year canes that are producing fruit as if you were pruning the canes, but leave them hanging in their current place. You can secure the cut canes to your trellis with plastic ties to support the fruit’s weight if necessary. Allow the fruit to dry on the canes. The sun will cause the moisture in the grapes to slowly reduce, drying them out gradually without losing any of those essential fruit sugars. During this time period, avoid any moisture getting onto the leaves or fruit so damage can’t occur. The leaves will dry out and fall off, exposing the fruit to full sun conditions and aiding in the drying process. Once the raisins are shriveled and leathery, just like storebought raisins, you can cut the clusters off and strip the raisins from the clusters. If necessary, you can spread your raisins out to dry further on fine mesh trays which allow air to reach all sides of the fruit. However, the longer you can leave your fruit exposed to the sunlight on the vine, the better it will taste! As with so many other types of produce, moisture is the enemy when storing grapes. Any moisture can cause your grapes to develop mold or other issues, shortening their shelf life. In addition, taking grapes off their stem leaves an open spot at the stem end where bacteria can enter the fruit, breaking it down more quickly. That’s why single grapes seem to spoil so fast! The best way to store your grapes is to place them in a ventilated plastic or mesh bag lined with paper towels to absorb any moisture. Keep them on the stem, and do not rinse them off before storing them. Be sure you remove any which are past their prime before storing. Grapes stored in this fashion can last for 2-3 weeks, but you’ll still want to check on them. And, of course, the faster you eat them, the better they will be. Also, one thing to remember: grape leaves themselves can be quite useful, and are often used in pickling or as part of Greek cuisine. Selecting healthy, lush grape leaves from your garden to use in Mediterranean recipes is an added perk! If you have fresh grapes that you wish to preserve, there are a number of ways to go about it. I personally love to rinse off, full dry, and then freeze my table grapes. The grapes will thaw back out a little softer than before, but they actually taste fantastic in their half-frozen state and can be a delicious treat on a warm afternoon. They’re also great in smoothies! Juicing your grapes or making jams/jellies out of them is also an option. Once juiced, the juice can be frozen to keep it intact or fermented into wine. Making jam or jelly with your grapes can also work extremely well as a sweet treat, and the resulting jars can be used at a later date. Don’t forget that you can make grapes savory by making different chutneys from them. These combine grapes with other flavors to make for a distinctly different savory application! A few varieties of grapes are used whole in canning, especially in fruit cocktail mixes. However, the texture of your grapes change drastically in the canning process, becoming soft and slippery rather than firm and juicy. If that’s not a problem, canning works well! Did you know you can pickle grapes? There are recipes available that will teach you how to pickle these fruits to make a sweet and tangy treat for a later date. A mixture of spices and vinegar with your grapes and grape juice will give them an interesting, unique flavor! Finally, break out your trusty dehydrator, as you can make grape fruit leather from the juice. A favorite of kids far and wide, fruit leathers can be stored wrapped in wax paper in an airtight container for quite a while, but they probably won’t last very long once made! Grapes can be finicky in a lot of different ways. The environment has effects on the grapes, the weather has effects, etcetera. But what of pests and diseases, and what other problems may arise? Let’s talk about that. Early bud break can occur. 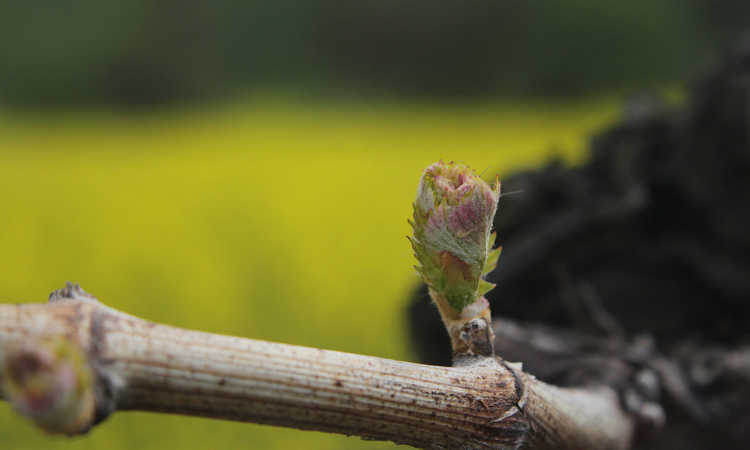 This is when the grape vines begin to come out of dormancy before the danger of frost has ended, and the buds show signs of life. Freezing conditions can cause serious damage to any new growth that might appear. If you need to protect your plant during an early bud break situation (below 35 degree temperatures), set up a mister or sprinkler to continually mist your plants until the weather warms. While this seems counter-intuitive, the running water will prevent the buds from freezing again. Another problem commonly caused by weather conditions is coulure. Sometimes called shatter, coulure is when overly cold and rainy conditions or excessive heat at the end of the flowering stage prevents grapes from forming. While this condition is most common in wine grapes, coulure can happen in other types as well. 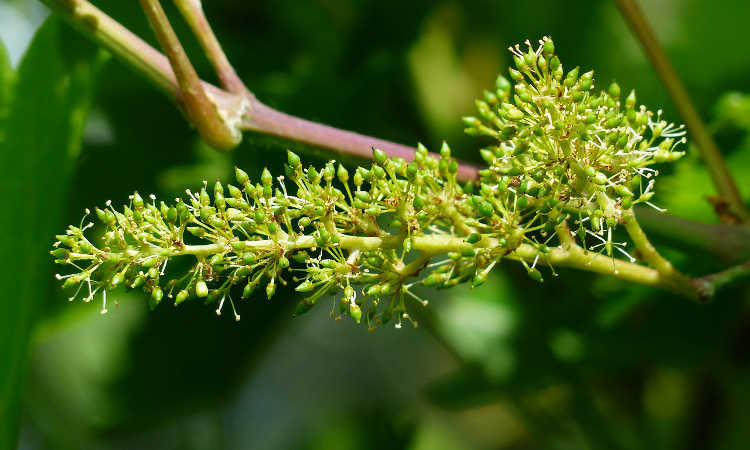 It’s important whenever possible to ensure that your vines have good conditions during the flowering stage to try to ensure that fruit set can occur. Finally, there is millerandage. This situation is also caused by cold or rainy weather during the flowering period, but instead of preventing grapes from forming, it causes the grapes to develop at different speeds, meaning that when some of the fruit is ready to harvest, the rest isn’t. Millerandage can be both beneficial or detrimental to winemakers. Some varieties of wine are actually enhanced by having some less-ripe fruit juice mixed with the ripe. Others are distinctly harmed, fouling the taste of the resulting wine. 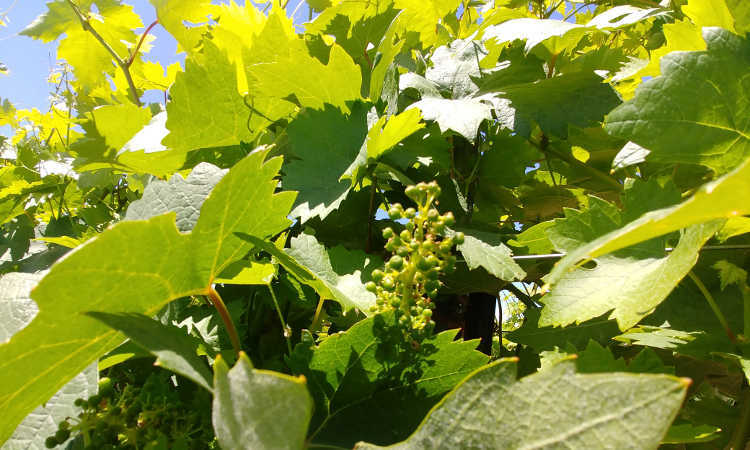 Ensuring that your grapes are evenly fertilized during the flowering period will prevent millerandage, but inclement weather can make that difficult. Again, try to protect your vines during the flowering stage as much as possible. There are a number of pests which prey upon grape vines. When growing grapes, it’s important to try to defend both the plant itself as well as its fruit. Let’s go over the usual problem pests. Aphids in general can wreak havoc on grapevines, although the common garden aphids are more a pest of the fruit than of the vine itself. But root aphids of the Phylloxera family are a massive danger to grapevines, especially those used for wine grapes. Root aphids will cause damage beneath the soil, making it hard to identify what the cause is. Plants lose their vigor, developing curling or withered yellow leaves. Fruits will be small or stunted. 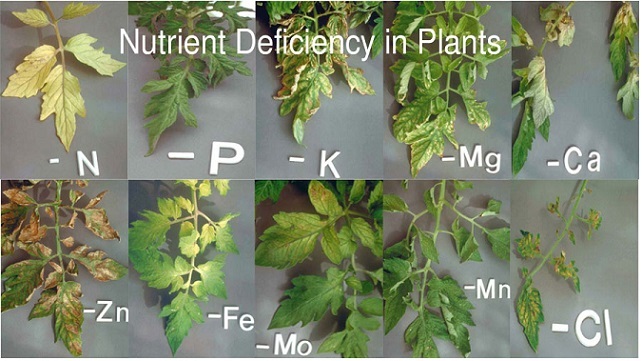 It can look very much like a nutrient deficiency. To treat root aphids, you can use a diluted pyrethrin-based spray like Bonide Pyrethrin Concentrate or PyGanic to drench the soil along the roots. This should kill off most of the hatched aphids. Retreat again every two weeks to kill off subsequent hatchlings. Another common pest is Japanese beetles. These love to devour the leaves and young fruit on your grapes, and when you see one, it indicates that there’s likely eggs and grubs hidden in the soil waiting to hatch. Neem oil is an effective preventative measure against Japanese beetles. 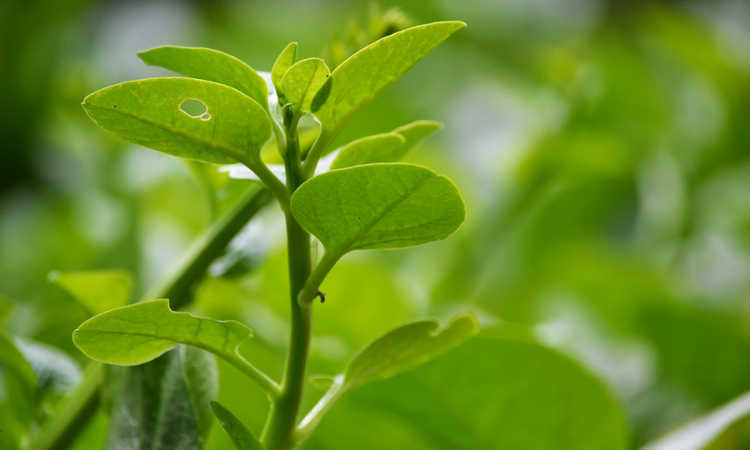 While this does not outright kill the beetles, eating leaves with neem oil on them stops the larvae that hatch out of the eggs from reaching adulthood. It’s a slow process, but regular spraying will keep them away. The larvae of the black vine weevil chew tunnels through your vine’s root system, causing severe damage and leaving the plant open to diseases. Adults will chew notches into leaf edges. These nonflying insects cause damage throughout their lifecycle. Keeping adult weevils at bay can be done by spreading food grade diatomaceous earth over all leaf surfaces and on the soil’s surface. While it needs to be reapplied if it gets wet, it’s a very simple way to deal with a bad problem. Beneficial nematodes will take out soilborne larvae. 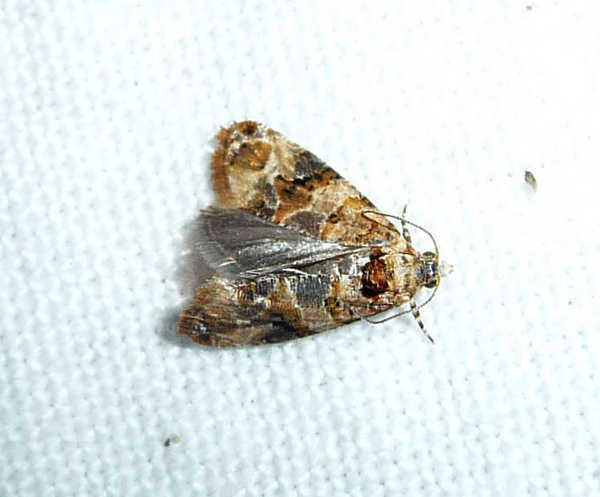 The European grapevine moth can become another major problem. Not only do the larvae of this pest feed on flowers and fruit, but they transmit diseases such as botrytis cinerea. In fact, a multi-year battle was waged in Napa Valley when this pest appeared, ending in 2016. The larvae of these moths can be destroyed by using bacillus thurigiensis, or BT. Available as both a powder or a spray, this bacteria will poison the moth larvae and they will die off. Parasitic nematodes are another problem. These carry diseases such as grapevine fanleaf virus, and as they’re microscopic they are hard to locate. 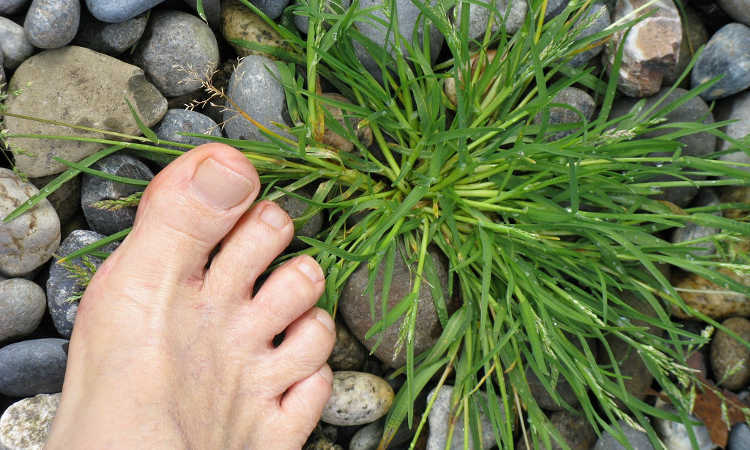 These live beneath the soil’s surface and cause root damage to your plants. Defeating parasitic nematodes can be done in two ways. Beneficial nematodes can be introduced, and they will kill the parasitic ones as well as root aphids and other soilborne insects. Otherwise, a soil drench of diluted pyrethrins (see above) can be used to kill off all nematodes. Finally, the last pest isn’t a typical pest at all. Birds will happily eat Japanese beetles, European grapevine moths, and black vine weevils, making them beneficial most of the time. Unfortunately, they will also devour your fruit when it’s ripe! Keeping birds at bay as your grapes ripen is usually your best bet. 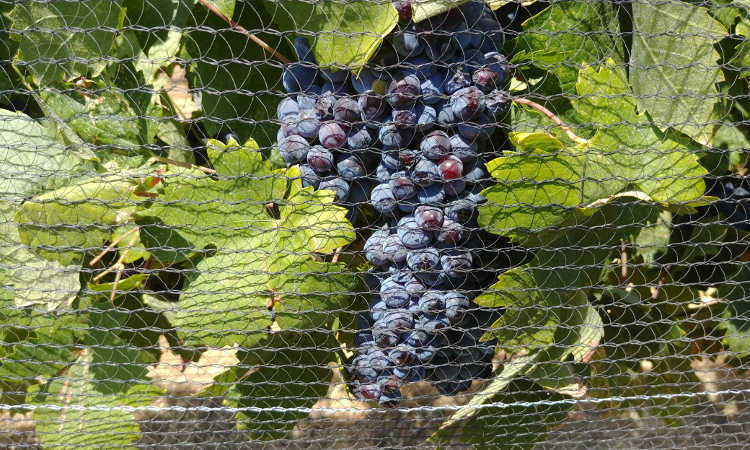 Use bird netting to protect your fruit from bird attack while allowing the birds free access during flowering and early fruiting. This ensures that the birds will eat your pests, but not your produce. Some diseases which grapes develop can be beneficial in limited amounts. However, most are dangerous to both the vine and your eventual harvest. Botrytis cinerea is both good and bad. In limited quantities right before harvest, this fungal grey mold can be used to concentrate the sugars in grapes. 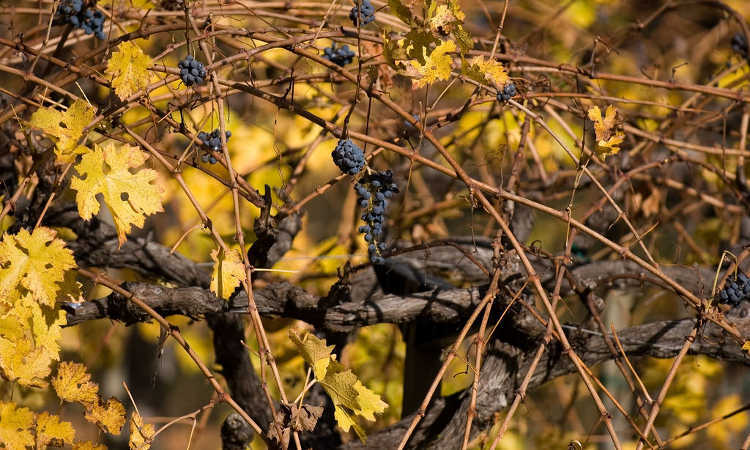 At that point, it’s often called the “noble rot“, as it can be beneficial to winemakers. But too much of a good thing can be a problem. This fungal mold is what also causes fruit to rapidly decay after harvest, and so for raisins and table grapes, prevention is important. However, it’s tricky to fight. Using neem oil as a preventative can help, as can spraying a copper fungicide on visible fungal growth. 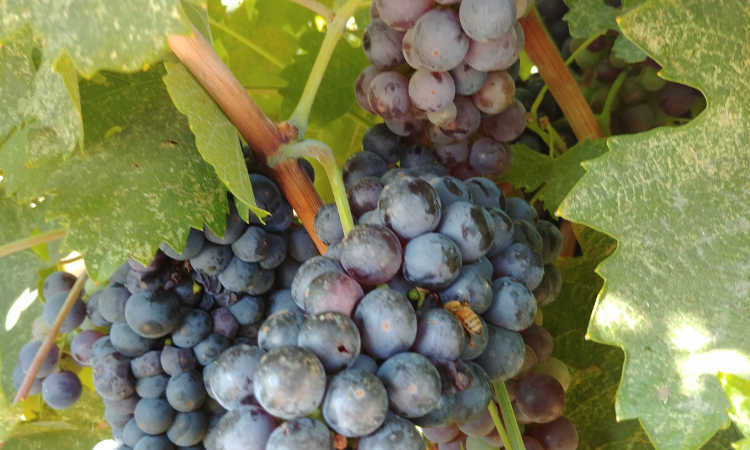 I’ve written a lot more about the noble rot and how it can be beneficial in our piece on botrytis cinerea, and I definitely encourage you to go read more about this disease and how to manage or treat it, as well as how the “noble rot” can be of use in grape growing! Fusarium, one of the primary causes of damping-off, can cause basal rot in grapevines. This is often one of the diseases spread by root aphids, and a couple Fusarium species are common: Fusarium oxysporium, and Fusarium solani. 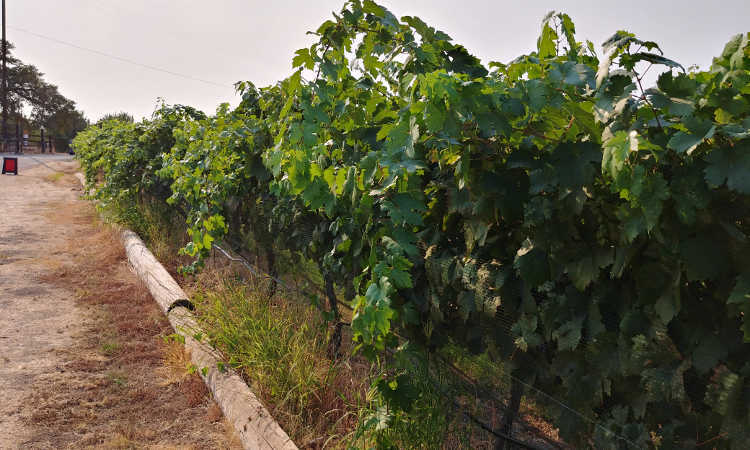 As grape vines are nearly impossible to move once they’ve become established and there’s no treatment for fusarium, infected plants must be cut out and destroyed. Thus, it’s better to prevent fusarium from taking hold. Be certain to avoid overly-wet conditions in the soil, as that can promote fungal disease spread. In addition, consider adding beneficial mycorrhizae and beneficial bacteria to the soil. Our article on fusarium shares more methods of prevention as well! One of the most common issues when growing grapes is powdery mildew. Caused by fungal development on damp leaves, this mildew creates a whitish powder on the surface of leaves and can cause the plant to have difficulties with photosynthesis. Thankfully, powdery mildew is easy to treat. Regular applications of neem oil on all leaf surfaces will kill off any mildew spores in evidence and prevent further spread. Black rot is a common and potentially disastrous fungal disease of grapes. This condition causes some of the grapes in a bunch to shrivel and become mummy-like, and leaves and shoots will develop brownish lesions. Currently, no organic measures are 100% foolproof for eliminating black rot. However, limited success has been achieved by maintaining dry leaves and stems, good pruning measures, and doing applications of copper fungicide on a weekly or biweekly cycle. Some inorganic fungicides are available to treat black rot, so if you are comfortable with using chemical inorganic solutions on your fruit and vines, there are a number of types available. Finally, there is the grapevine fanleaf virus. Spread by nematodes at the root level, this virus causes yellowing of the leaves and lowers fruit quality. It can be easily transmitted by nematodes between the plants, and there is no way to cure it. Prevention is the key to this virus. If you find a plant showing signs of grapevine fanleaf disease, remove it entirely and dispose of it. Either do a pyrethrin soil drench or add beneficial nematodes which attack root-feeding ones. Sterilize your pruning tools between cuts. Thank you to the Cordi Winery in Live Oak, CA for allowing me to take a number of close-up photos of their Primitivo vines (and for having some delicious wines, too)! 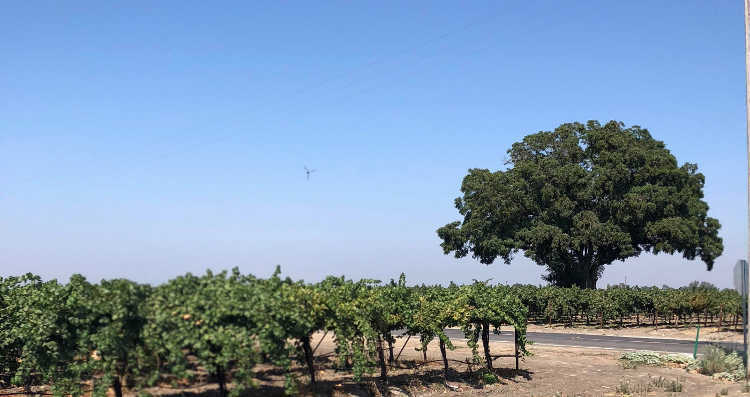 Also, thank you to Dez Fuhrman for sharing your great photos of vineyards in and around Lodi, CA! When properly cared for, you can start growing grapes and have fruit for decades to come. Do you grow grapes, and if so, which varieties are your favorites? What do you do with your harvest? Share your vine knowledge and tales in the comment section! Thank you very much your guide in vegetable and fruit production are greatly helpful as an agriculture teacher in secondary high school.